Tzatziki is a great sauce that goes well with grilled pork or chicken - or anything else, for that matter. We love it. Usually, it's mostly garlic and cucumber, but this time, I added the zest from one lemon, and some chopped mint, for a completely different twist on the original. It was really tasty - we served it with a spread of "greek-ish" food, while trying out my new olive oil from Kallaras. Coarsely grate the cucumber, and squeeze out as much water as you can. 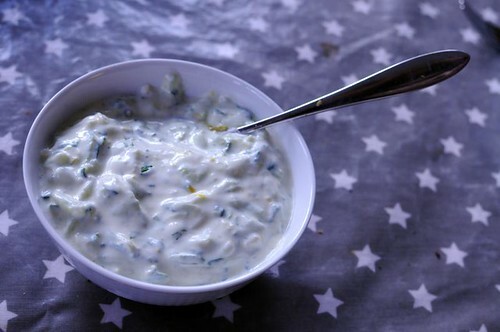 Mix the cucumber with yogurt, olive oil, minced garlic, lemon and mint. Season with salt. I usually do mine with mint, but the lemon zest is new to me! Great idea! I Kivik åt jag en äppletzatziki, låter kanske konstigt, faktiskt jättegott till lax!